THE GOVERNMENT HAS indicated that the Seanad will be reformed in the event that the referendum to abolish it is rejected by the electorate in October. The debate on the future of the upper house kicked off this week after the Taoiseach Enda Kenny confirmed the government’s intention to hold a referendum on whether or not to abolish the Seanad later this year. The proposed 32nd amendment to the Constitution will be supplemented with planned changes to Dáil procedures including more sitting days and more committee scrutiny of legislation. 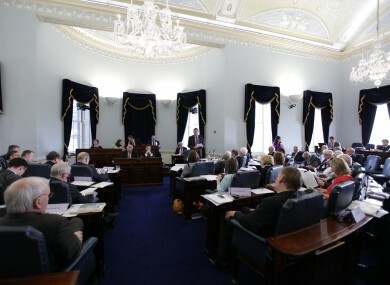 Those advocating retention of the Seanad argue that it is in need of reform rather than abolition with two senators, Feargal Quinn and Katherine Zappone, having already launched a Bill which would significantly alter the make-up and functions of the upper house. Speaking on RTÉ’s Morning Ireland on Thursday Agriculture Minister Simon Coveney gave a strong indication that reform of the Seanad would happen in the event of a no vote in the referendum. “If the people in their wisdom decide that they want a reformed Seanad and they want to retain it well then of course it’s their right to make that decision,” Coveney said. On foot of this TheJournal.ie asked the government if this means that if the referendum is rejected by the Irish people then the Seanad will be reformed by the current government. In response, a spokesperson said: “As the Taoiseach stated yesterday the Government is of the view that Ireland simply has too many politicians for its size and the Seanad is no longer relevant or needed. The Government is putting a referendum to the people, as committed to in the Programme for Government. The Government has made clear that the referendum will be a yes or no question on the abolition of the Seanad. Clearly, people who decide they would rather see the Seanad reformed than abolished have the opportunity to vote no. Democracy Matters, a group campaigning for a No vote in the referendum, has now called on the government to commit to reform of the Seanad if the referendum is rejected. Barrister and former Fianna Fáil election candidate, Noel Whelan, said: ”We [Democracy Matters] would of course encourage those in favour of reform of the Seanad to vote no to the referendum and thereby in favour of retaining it. The Quinn/Zappone Bill would put in place elections to the Seanad on a one person-one vote basis, gender equality among members and a number of additional functions and powers including the ability to scrutinise ministerial appointments and statutory instruments. Email “Government indicates Seanad will be reformed if abolition is rejected ”. Feedback on “Government indicates Seanad will be reformed if abolition is rejected ”.